Myss Lafunky's Blog: On A Mission For God. THIS MEANS WAR!!! On A Mission For God. THIS MEANS WAR!!! Join me in suffering like a good Soldier of Christ Jesus (2 Timothy 2:3). Who are soldiers? Soldiers are trained to fight for their countries, they usually spend many months, days, years away from their home. Soldiers are highly trained and well equipped to fight, with the aim to win. Soldiers have special love for their countries, this is displayed by their dedication, courage and bravery to fight. Soldiers are usually loyal to their individual country and to their organisations. Soldiers are instructed to obey their rules and orders. Do you know that, every Christian that has accepted to follow Jesus as his or her Lord and Saviour, and any Christian that has accepted to follow God's instructions automatically becomes a Soldier of Christ? What does it mean to be Soldiers of Christ? Linking it to 2 Timothy 2:3-4, Soldiers of Christ are children of Jesus Christ, those who have accepted Jesus Christ into their hearts. Those who follow God's instructions, however they are not forced to obey the instructions in comparison to soldiers that are fighting for their countries. While soldiers of Christ are not forced to obey God's rules, they must be ready to face the consequences of their actions (positive or negative). Being a soldier of Christ is not full of bed of roses at all times and neither was it mentioned that it would be full of roses. The Bible states in 2 Timothy 2:3-4 that, Soldiers of Christ must endure hardship. This suggests that, as soldiers of Christ, we would suffer, however those who continue to please the Lord and are guided by Him would sail through the hardship. 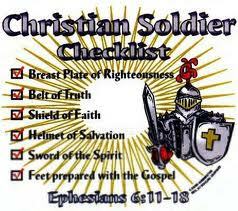 Are you a Soldier of Christ? Have I made a commitment to be a good soldier of Christ? Satan has been defeated by Christ, he knows he has been defeated. Are you defeating him in your daily life? During hardness, would I still work as a true Soldier and use the right equipment to defeat Satan? During hardship, would I be a true Soldier of Christ and would I strengthen my faith so that I can be victorious? It's not going to be an easy fight or race, there will be wounds, illnesses, mixed emotions, falls, trials, temptations, sufferings etc. May the Lord help me to use the armour of God (Ephesians 6:10-18) to win the victory. As a soldier of Christ, I must have the right training, right attitudes, and be in the right environment to win the battle. The Lord has overcome the world, God said we should be of good cheer (John 16:33). It is now up-to me to win the victory on earth. Devil must not win this battle. I must be victorious and keep the faith (1 John 5:4- Because everyone who has been born from God has won the victory over the world. Our faith is what wins the victory over the world). I must not be a slave to Satan in my conduct, speech, actions and in everything that I do. I must read the Word of God every day. I must defend the Word of God every day. I must support the Word of God every day. I must put into practice God's instructions as written in the Bible. I must be committed at all times to God regardless of challenges that I may encounter. I must remember that, FAITH, PRAYER and the WORD of God are my weapons. I must follow what the Holy Spirit tells me. Finally, I must be reliable, dependable, capable and faithful. Prayer For Your Family and For Your Marriage.. Dealing With “Thus Saith The Lord” Prophecy. I'm too ashamed to tell him...Kindly advise.